Allow steaks to come to room temperature for 25 - 30 minutes. 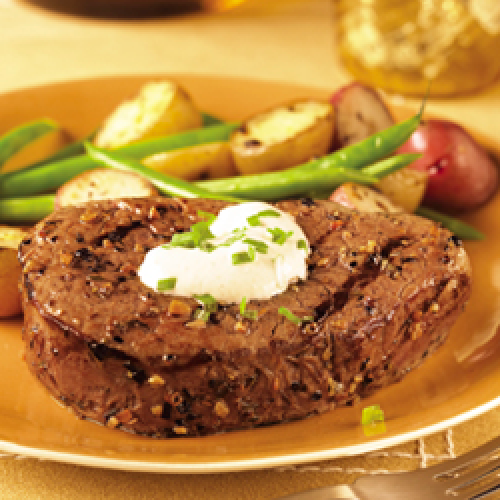 Combine garlic, thyme and pepper; press evenly onto beef steaks. Place steaks on grid over medium, ash-covered coals. Grill, covered, 10 to 14 minutes (over medium heat on preheated gas grill, 11 to 15 minutes) for medium rare (145°F) to medium (160°F) doneness, turning occasionally. Meanwhile, combine Horseradish Cream ingredients in small bowl. Season steaks with salt, as desired. Serve with Horseradish Cream and your favorite sides.